Aqua Marina has been killing it with their iSUPs’ line that includes boards for every water activity that you can possibly think of. 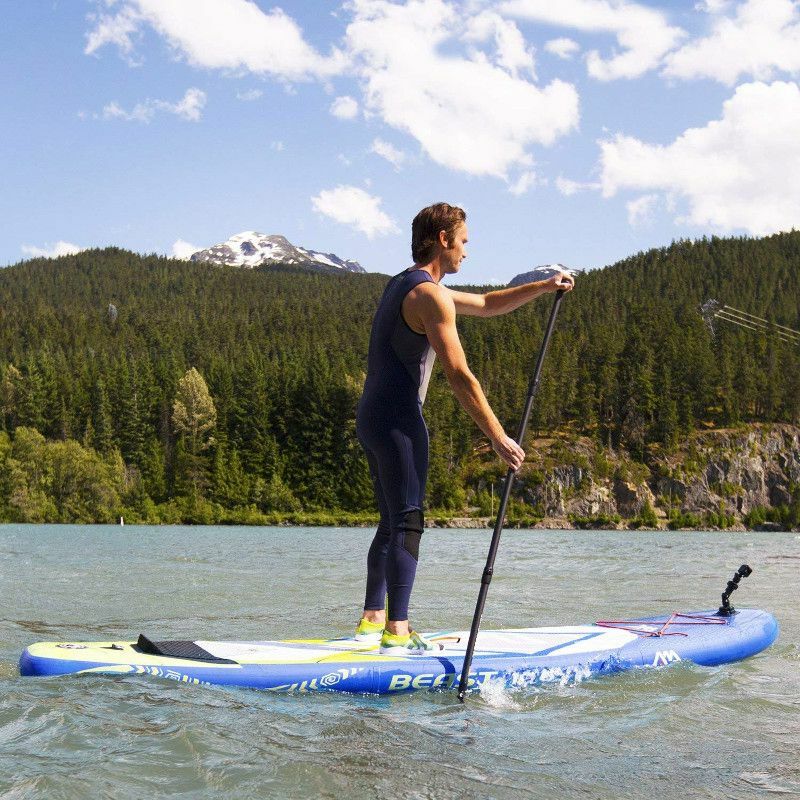 The amount of work and dedication this company pours into their products resulted in some of the best inflatable standup paddle boards on the market. Thus, Aqua Marina is a reputed and renowned brand with a large variety of products that cover most of water sports and activities. In this review, one of their beautifully designed iSUPs will get its own spotlight because I’m sure many people out there are looking for something exactly like it. The Aqua Marina Beast is our guy this post, and we’ll try to cover everything you’d possibly need to know about it. The Beast is an all-round iSUP that’s 10.6 feet tall, 32 inches wide and 6 inches thick. This board is neither small nor large; it’s something nicely in between and it can used by different paddlers as it’s capable of performing in different water conditions. Also, the width aspect here is as great as it could be; nothing can really flip over this board once it’s in the water. Thus, the rider gets to enjoy a great deal of stability and sturdiness. As for the previously mentioned 6 inches thickness; it’ll be almost impossible to see this iSUP struggle in the water. 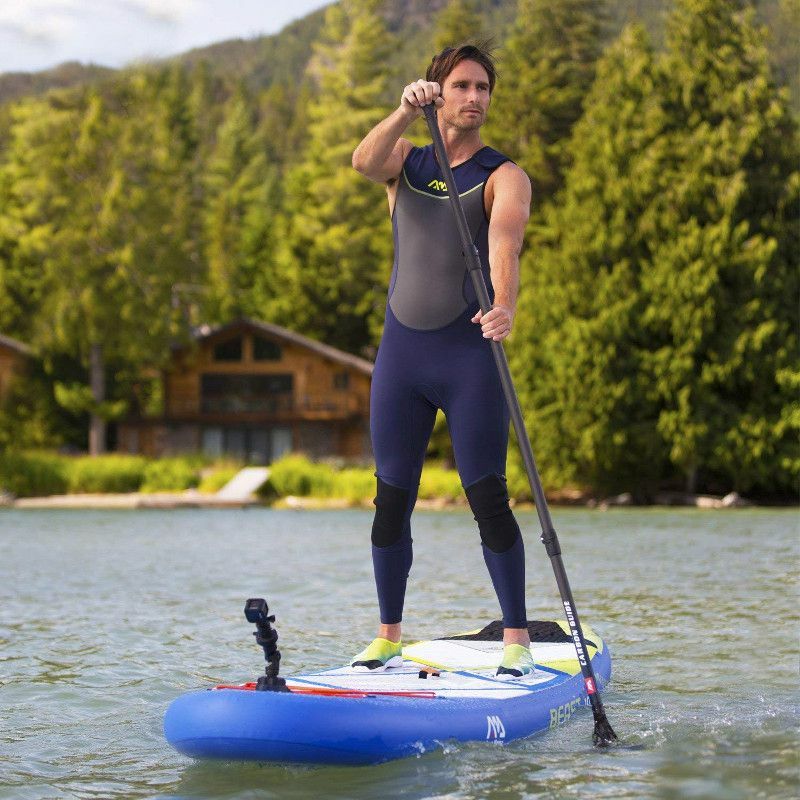 The Beast floats comfortably and glides smoothly even when you hit the weight limit. The Beast, like all of Aqua Marina’s inflatable paddle boards, is built using the best material choices in order to create a board that’ll make it through any possible circumstance untouched. Thus, this iSUP was made using military grade PVC material that usually results in making some of the toughest inflatable products out there. The Beast is made to overcome the fear that an inflatable can easily go to waste; the stiffness of this iSUP can’t help but make you think that it’s as hard as an authentic board. The 1000 Denier reinforced rails allow the board to be fully inflated taking its best final shape to the point where you might forget that it’s an inflatable. All in all, the whole line from which the Beast is coming from is highly impressive; the precision of detail, rigidity and stiffness are all qualities of this Aqua Marina Beast iSUP. It is here where you get a close up view of the iSUP’s details and everything you’ll find featured. Let’s start with what’s obvious. The Beast is a heat embossed iSUP that’s given a sharp and attractive graphic design to match its title. The traction pad which covers 2 thirds of the board’s back is part of that design and it looks both rugged and innovational. This pad works perfectly supporting your whole body while paddling; your feet will be glued to the pad for how grippy it is. Not only that; most of Aqua Marina’s all-round iSUPs are featured with this awesome kick rail pad near the board’s tail. This pad will allow you to spice up the board’s performance so you can carry out some cool maneuvers and step up your paddling experience. The rail kick pad comes really handy when taking quick and critical turns or waves. That brings us to the navigation system of the Beast. This one right here consists of a single removable large fin only. It’s sharp and very easy to attach/detach and it does a great job keeping the board in a straight tracking line. Next, there is the camera mount on the board’s nose; this mount now is somehow a feature that’s becoming highly demanded by paddlers; it’ll allow you to easily install an action camera and record all the adventures and memories made on this board. Once in the water, you might end up needing one thing or another. The bungee system makes it possible for you to secure whatever cargo you might need to the board right in front of you. Even the paddle can go there for when you’re taking a break from paddling. Last but not least, the Beast is featured with a rubbery central carry handle that would make it possible for the smallest individual to carry the inflated board single handedly. It’s super tough, yet it has a very comfortable grip. The Beast is a fully equipped iSUP that lacks nothing for it to be perfectly functional anytime and anywhere. The value you’re getting for the price you’re paying is definitely a great one. Lacking the paddle doesn’t necessarily make this iSUP any less cooler. Aqua Marina created this Beast iSUP with a vision in mind where riders with different skills and interests can easily get the best of its performance. 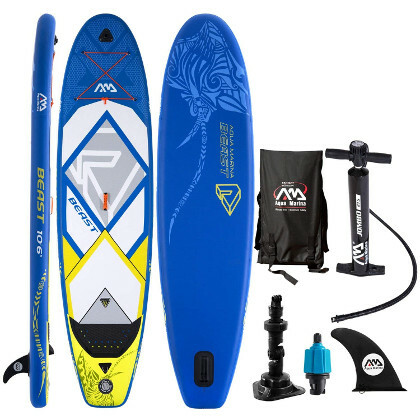 This board is capable of adjusting to different water conditions which is the main reason why many of you are opting for an inflatable SUP in the first place. 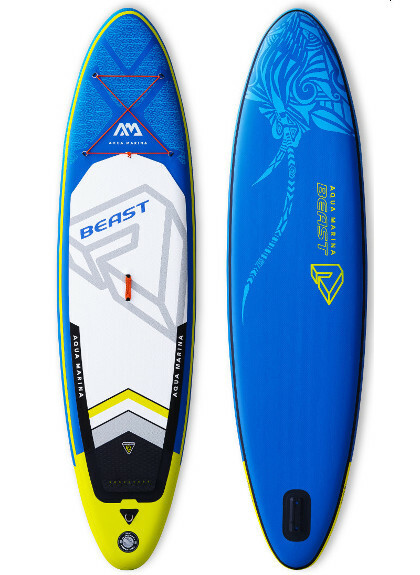 The Beast delivered a great performance in flat water; the tracking was neat and smooth while controlling the board was a piece of cake. This iSUP doesn’t have much wobbliness to it; once you get a grip on it you just jump onto it and off you in complete balance. It’s basically a great iSUP for beginners and intermediate level paddlers who are up to some fun. However, in terms of speed, this is definitely not meant for racing, but I guarantee you that it can catch some really good waves anytime of the year. It comes with a camera mount for video recording enthusiasts. It’s a stable, versatile and durable board. The Beast is built using reinforced 1000 Denier rails and PVC material. It can hold up to 310 lbs and it only weighs 20.5 lbs. It’s meant for different riders’ levels.